Home 〉 Internal Bifold Doors 〉 Glazed White P10 Roomfold - Frosted Glass 〉 White Bifold 3 Door System ( 3 X 21" Doors ) Frosted. Need a different size/product? 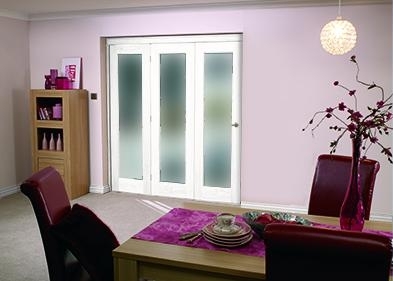 White Bifold 3 Door System (1800mm 6ft) Frosted.White Bifold 3 Door System ( 3 X 24" Doors ) Frosted.White Bifold 3 Door System ( 3 X 27" Doors ) Frosted.White Bifold 4 Door System ( 4 X 21" Doors ) Frosted.White Bifold 4 Door System (2400mm - 8ft) FrostedWhite Bifold 4 Door System ( 4 X 24" Doors ) Frosted.White Bifold 4 Door System ( 4 X 27" Doors ) Frosted.White Bifold 5 Door System ( 5 X 24" Doors ) Frosted.White Bifold 5 Door System ( 5 X 27" Doors ) Frosted.White Bifold 6 Door System ( 5 + 1 X 24" Doors ) Frosted.White Bifold 6 Door System ( 5 + 1 X 27" Doors ) Frosted.White Bifold 6 Door System ( 3 + 3 X 24" Doors ) Frosted.White Bifold 6 Door System ( 3 + 3 X 27" Doors ) Frosted.